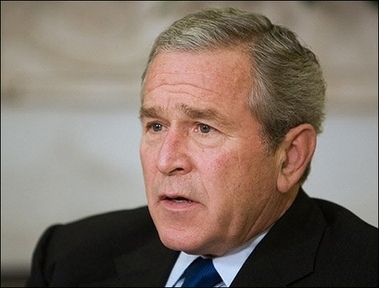 US President George W. Bush said that he hoped China would transform from a country where people "hoard the money they have" into one where people buy large amounts of US products. In an interview with conservative radio talk show host Rush Limbaugh, Bush said China should become "a society in which there's consumers. Because now they're a society of too many savers." "And the reason why they're saving so much money is because there's not a pension plan or a legitimate health care system. And so, therefore, people hoard the money they have in anticipating a bad day," said the president. "If we can encourage China to become a country of consumers, you can imagine what it would mean for US producers and manufacturers to have access to that market," he said. Bush also said that the United States must remain present in East Asia because "we serve as a way to make sure that there's stability. And stability in the Far East, obviously, is essential for the United States in the long term." "And therefore, that's why we'll have a presence there and should have a presence there for the long term," he said. The interview came with less than one week before key US legislative elections in which Bush's Republicans worry that the unpopular war in Iraq may cost them control of the Senate, the House of Representatives, or both.